Fluid requirements differ between infants and children. It is important for children’s nurses to understand the principles of fluid mechanics and apply this understanding to ensure each child’s state of hydration, and thereby preserve their safety and well-being. 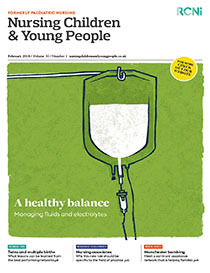 This two-part article aims to introduce the concept of fluid balance and electrolytes to children’s nursing students, help them identify what is normal and what is not, and provide guidance on what actions should be taken when problems occur. It may also be useful for registered nurses to use for revalidation.